"No knowledge is to be found without seeking, no tranquillity without travail, no happiness except through tribulation. Every seeker has, at one time or another, to pass through a conflict of duties, a heart-churning." Bhagavad Gita is the manifestation of the entire Hindu religion in one book, and the quintessential translation done by none other than the Mahatma, captures the text in its sense and spirit. Anasakti Yoga, as Mahatma Gandhi liked to call it, is a book that shows a way to attain self-realization. Gandhi writes, "Gita shows the virtue of self-surrender and selfless devotion. All actions bind the self, but if all are dedicated to the Lord they do not bind, rather they release him. He who has thus extinguished the "self" or the thought of ‘I’ and who acts as ever in the great witness’ eye, will never sin nor err. The self-sense is at the root of all error or sin. Where the ‘I’ has been extinguished, there is no sin." 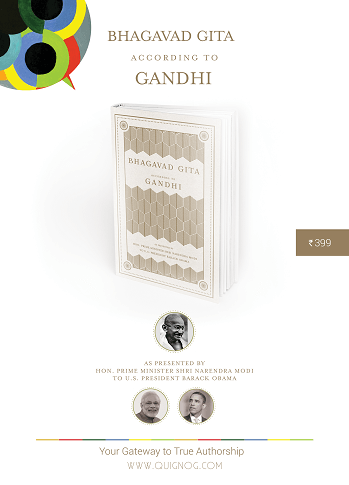 This unique and very special edition of Bhagavad Gita has been compiled and presented as a commemoration of India's Prime Minister Shri Narendra Modi's gift to the then President of the United States of America, Mr Barack Obama in 2014 during his US visit. As Shri Modi presents Gita to the leaders of the world, over a billion people find peace and purpose in these words of Krishna through Gandhi. Mohandas Karamchand Gandhi (2 October 1869 – 30 January 1948) was the leader of the Indian independence movement in British-ruled India. Employing nonviolent civil disobedience, Gandhi led India to independence and inspired movements for civil rights and freedom across the world. The honorific Mahatma (Sanskrit: "high-souled", "venerable")—applied to him first in 1914 in South Africa—is now used worldwide. In India, he is also called Bapu (Gujarati: endearment for "father") and Gandhiji. He is unofficially called the Father of the Nation. Assuming leadership of the Indian National Congress in 1921, Gandhiji led nationwide campaigns for easing poverty, expanding women's rights, building religious and ethnic amity, ending untouchability, but above all for achieving Swaraj or self-rule. He attempted to practise nonviolence and truth in all situations, and advocated that others do the same. He lived modestly in a self-sufficient residential community and wore the traditional Indian dhoti and shawl, woven with yarn hand-spun on a charkha. He ate simple vegetarian food, and also undertook long fasts as a means of both self-purification and social protest. Mahatma Gandhi's birthday, 2 October, is commemorated in India as Gandhi Jayanti, a national holiday, and worldwide as the International Day of Nonviolence. 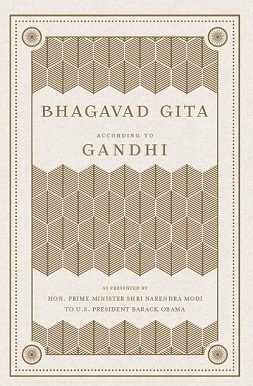 This unique and very special edition of Bhagavad Gita, the original text of which according to the Hindu believers date back to 5000 years and over 2300 years according to modern historians, has been compiled and presented to our readers as a commemoration of our Honourable Prime Minister’s gift to the then President of the United States, Mr Barack Obama in 2014 during his US visit. Mahatma Gandhi, even with passage of a long time, remains as a strong force of ideology and his life has been a living demonstration of the very philosophy he so ardently believed in. While many would find Gita as a contradicting text to this deep idea of rooted non-violence, it is always a fulfilling exercise to pick up The Bhagavad Gita by Gandhi and remind ourselves the scope and breadth of this doctrine of Karma. Gandhi referred to the Gita as Anasakti Yoga or the Gospel of Selfless Action and regarded it as a prime source of inspiration. He personally vouched for the accuracy and originality of this translation by Mahadev Desai. Gandhi told-"When doubts haunt me, when disappointments stare me in the face, and I see not one ray of hope on the horizon, I turn to Bhagavad Gita and find a verse to comfort me; and I immediately begin to smile in the midst of overwhelming sorrow. Those who meditate on the Gita will derive fresh joy and new meanings from it every day." 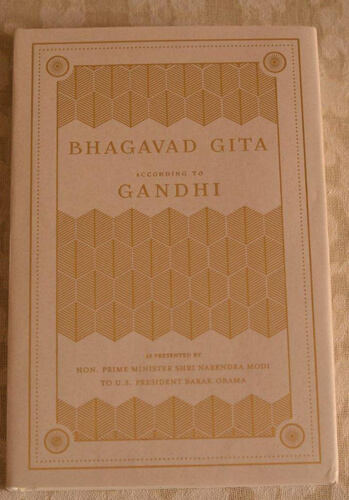 Prime Minister Narendra Modi, in presenting a copy of this version of the Bhagavad Gita to United States President Barack Obama when he visited the White House in September 2014, declared that the Gita would be the gift that he would carry for all world leaders. There was a lot of buzz around this incident in the media, taking all sorts of extreme viewpoints. Whether it was diplomacy or a part of a wider cultural habit, Modi’s belief in the text of Bhagavad Gita is undeniable. Former US President Barack Obama, who has often talked about the influence of Mahatma Gandhi on his life, paid homage to the 'apostle of peace' at the Rajghat memorial during his his India visit in January 2015, describing his spirit as a "rare gift" to the world. He wrote the following words in the visitors' book at the memorial: "What Dr Martin Luther King Jr. said that remains true today: The spirit of Gandhi is very much alive in India today and it remains a rare gift to the world. May we always live in this spirit of love and peace among all people and nations." Mahatma Gandhi acknowledged and struggled with the violence of the Gita, which he first read in 1888 or 1889 in London, not as part of his own living Gujarati tradition but in Edwin Arnold’s popular 1885 poetic rendering, The Song Celestial, together with Arnold’s The Light of Asia (a popular retelling of the life of the Buddha) and the Christian Bible. “My young mind tried to unify the teachings of the Gita, The Light of Asia, and the Sermon on the Mount,” Gandhi later wrote. Confronted with Krishna’s exhortation to Arjuna to engage in a violent battle, Gandhi argued that by urging him to “fight,” Krishna meant simply that Arjuna should do his duty. “Fighting” was merely a metaphor for the inner struggle of human beings, and nonviolence was a corollary of nonattachment to the fruits of action; therefore, actions such as murder and lying are forbidden, because they cannot be performed without attachment. On the other hand, the lawyer and Dalit spokesperson Bhimrao Ramji Ambedkar, contesting Gandhi’s claim to speak for Dalits (the lowest castes, or Harijans, as Gandhi called them, “the people of God,” generally called Untouchables at that time), argued that the Gita was a defense of the caste system and that it supported genocide over nonviolence. Gandhi ignored the warrior Gita at his peril: the man who killed him was driven by it. On the evening of January 30, 1948, Nathuram Godse, as Davis writes, “interrupted Gandhi at the prayer grounds [at Birla House, Delhi] with two bullets fired at point-blank range.” Two days before his execution, Godse wrote a final letter to his parents in which he argued that “Lord Krishna, in war and otherwise, killed many a self-opinionated and influential persons for the betterment of the world, and even in the Gita He has time and again counseled Arjun to kill his near and dear ones and ultimately persuaded him to do so.” Evidently Godse concluded that Krishna would have wanted him to assassinate the “influential” Gandhi for the betterment of the world. Like the revolutionary Khudiram Bose, Godse carried a copy of the Gita on the morning of his execution. 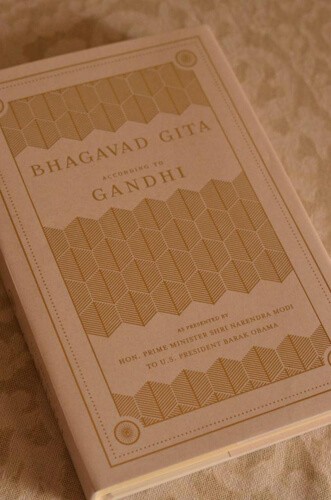 Prime Minister Narendra Modi presented a copy of the Bhagavad Gita to United States President Barack Obama when he visited the White House last year and one to Emperor Akihito of Japan. 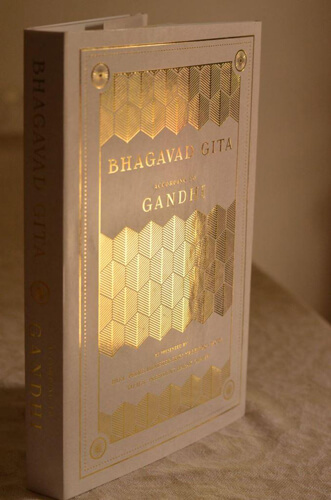 He has declared that the Gita would be the gift that he would carry for all world leaders. But then, it is all about reading it like Gandhi. Among all leaders of the Indian independence movement, none were more devoted to the Bhagavad Gita than Gandhi. He called it his “dictionary of daily reference” and his “mother.” He spoke and wrote widely on it throughout his career. But he also had an interpretive problem. In the course of the Gita Krishna persuades the reluctant warrior Arjuna to take part in a battle of cataclysmic proportions. Gandhi, by contrast, held no commitment more important than his principle of non-violence. The battlefield, Gandhi argued, must be taken as an interior one, where the forces of good and evil are locked in never-ending struggle. When Krishna tells Arjuna to fight, he is telling him to overcome any self-interested inclinations and to carry out his own righteous duty, Gandhi based his own authority as an interpreter of the Gita on his personal endeavor “to enforce the meaning in my own conduct for an unbroken period of forty years.” Gandhi also claimed that the Gita was not a Hindu work, but rather one of “pure ethics,” which a person of any faith might read.